A burglary gang hurled fuel and ‘spiked’ objects at a police car as it followed their speeding van during a dramatic chase. 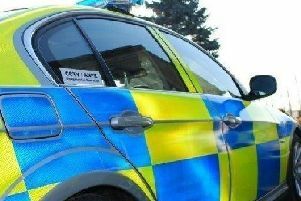 The town trio were spotted by police on the A19 with no lights illuminated on their Ford Transit van before racing at more than twice the speed limit through Hartlepool. It came after Charlie Dunn, 20, Jack Setchell, 19, and Robbie Lee Simpson, 23, first committed two burglaries in the remote Alston Moor area of Cumbria on July 18 last year. Jack Troup, prosecuting at Carlisle Crown Court, said the trio travelled from their native Hartlepool in a Ford Transit van and burgled two secure storage buildings. They struck first in the Garrigill area, forcing entry to a locked unit, from which high value tools, fuel and other equipment valued at £4,620 were snatched. They then broke into a second outbuilding, near the market town of Alston, and snatched an air rifle, a camouflaged security camera and car battery. All three left in the van which had no lights illuminated when it travelled past a marked police car in darkness near Hartlepool. Police chased the vehicle along the A19, and then onto Catcote Road, Brierton Lane, Stockton Road and Garston Close. “Metal objects were thrown from the windows towards the pursuing police vehicle,” said Mr Troup. As rear van doors opened, diesel was spilled into the road and metal “spiked” objects were hurled. The vehicle travelled at twice the speed limit in a 30mph area and driver Simpson was seen to flout a host of road rules. The burglars fled the vehicle in the Seaton Lane area, but were caught as police gave chase on foot. They each admitted two burglary charges. Simpson also pleaded guilty to dangerous driving, and Setchell admitted causing a danger to road users by obstruction. Mitigation was given by barristers on their behalf. Setchell, of Seaton Lane, was jailed for 48 months having also admitted dangerous driving and aggravated taking of a Range Rover Evoque in the Hartlepool area last March. Simpson, of Freemantle Grove, received 36 months’ custody, and Dunn, of Wordsworth Avenue, was locked up for 28 months. Setchell and Dunn were each handed driving bans, and must pass extended tests.